Alumni from across the nation attended Homecoming, including alumni from Washington, Texas, Kansas, Georgia, and all over the state of Missouri. On Friday, November 3, Dr. Woodrow Burt, HLG president, spoke at the Walk of Honor Dedication. We are here today to acknowledge the generosity and thoughtfulness of individuals who have helped establish this Walk of Honor. In a small way this walk will serve as a constant reminder to us, of the contribution that those named here have made and continue to make to our lives. 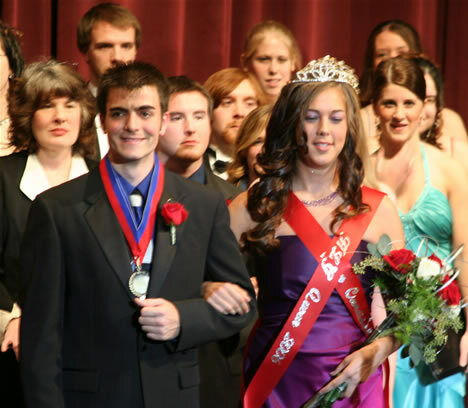 Megan DeHues and Cameron Beckerdite were crowned the 2006-2007 Homecoming Queen and King during the Homecoming Gala and Coronation on Friday evening, November 3. DeHues is a senior majoring in recreation management with a minor in business and coaching. DeHues is a member of the Lady Trojans soccer team and JV basketball team, Student Activities Committee, and is the President of Alpha Tau Beta. She is the daughter of Lyle and Janie DeHues of Lee’s Summit, MO. Beckerdite is a senior majoring in Bible. He is a member of Praise Song, concert choir, CMVF, and CMENC. Beckerdite is the son of Chuck and Jean Beckerdite of Versailles, MO. Other queen candidates were seniors Ashley Plaster of Centertown, MO., and Megan Swaringim of O’Fallon, MO. King candidates were seniors Sam Bonney of Elsberry, MO., and Aaron Wooff of Edwardsville, Ill.
Other Homecoming events included an alumni golf tournament and baseball game, a president’s reception, a variety show, a parade, the Trojan Turkey Trek, (for complete list of race results, click here) and volleyball against Missouri Baptist. The weekend ended with women’s basketball playing Iowa Wesleyan, and men’s basketball against Robert Morris. Between these games the new trophy case was dedicated to the men’s basketball teams from 1951-1956. The men from these teams bought replacement trophies for the ones lost in the fire of 1989, and also raised the money to buy the trophy case that was purchased last summer.